The K4 testboard is used for building various experimental circuits. It contains a 18 pin socket for the 16F628. K4 is a stripboard measuring 10 cm x 8 cm. The board comes with predrilled holes spaced 2.54 mm (1 inch). 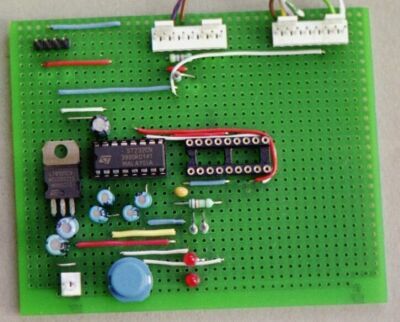 The main components are: A 78S05 voltage regulator, a blue reset button, two red LEDs, a socket for 16F628 and an ST232 for RS232 communication. The Molex connectors at the top are used for connecting external devices, e.g. a LCD display. The white 2-pin Molex connector in the lower left corned is used for connecting a power supply.